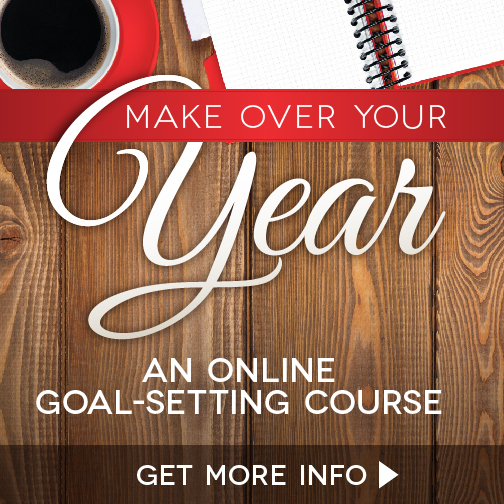 Is your gift wrap disorganized and chaotic? Do you get frustrated whenever you have to wrap a gift? 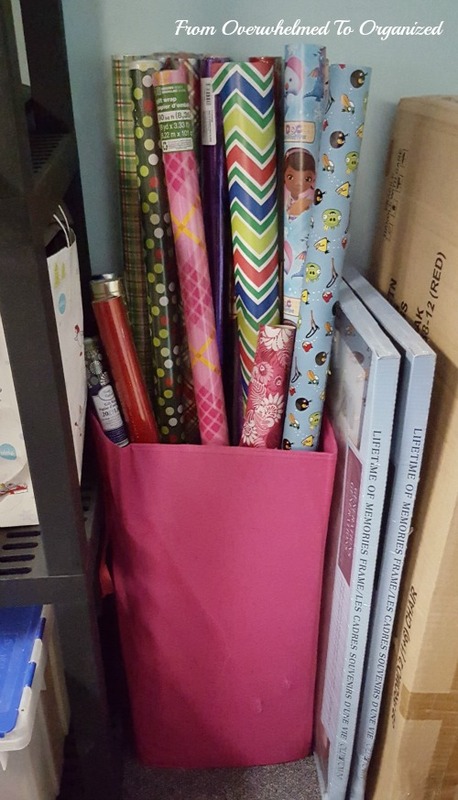 Organizing your gift wrap makes a huge difference! 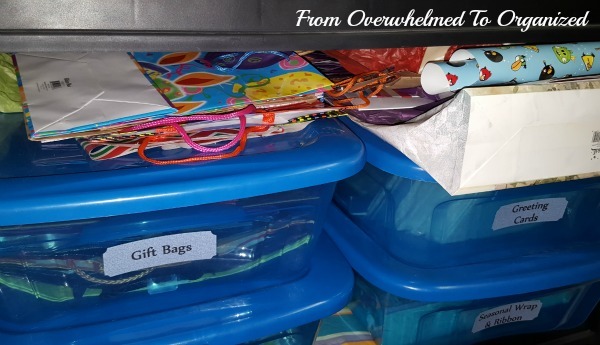 There are lots of ways to organize your rolls of wrap, gift bags, tissue, and flat gift wrap and you should pick one that works best for you and the kind of wrapping supplies you usually have. Note: I was given a Wrappy to review and the opportunity to give one away. 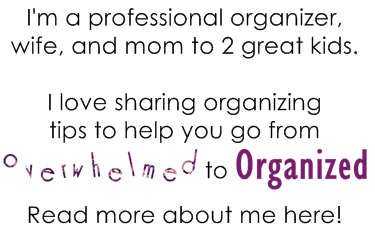 All opinions are 100% my own and I only recommend products that I believe will help you go from overwhelmed to organized. This post also contains affiliate links, which means if you purchase an item after clicking one of these links I'll receive a small commission at no additional charge to you. 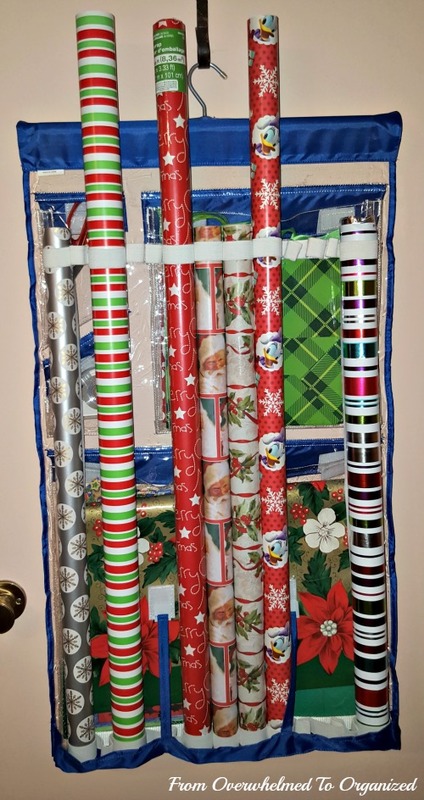 I've shown you previously how I organize my gift wrap, but at that time I didn't really have many rolls of gift wrap. Over the last couple of years, however, we've started using rolls of wrap more. Here's how I've been storing them. They're all standing in this tall bin in the corner of my basement. But maybe you've also experienced this problem... once you open the rolls, the edges of the paper get ripped or worn. Which means wasting some paper when I go to wrap a gift. I've tried elastics but they break or dry out or crunch the roll too much. Then I saw a tip online about cutting a slip in a cardboard tube (like a toilet paper roll) and putting that over top, so I tried that. But the cardboard stretches over time and ends up not holding the roll tight enough to protect the edges of the paper. I was also finding another problem with my shallow bins that I was using to store all the rest of my gift wrap. A lot of times we reuse tissue paper or gift bags from gifts we receive, and we also save larger pieces of wrap that are leftover when we cut off the piece we need from the roll. But they often end up getting messy inside the bins after awhile. Or, honestly, they're often just stuffed on top of the bins because we're too lazy to open the bins to put them away. I really needed something better! 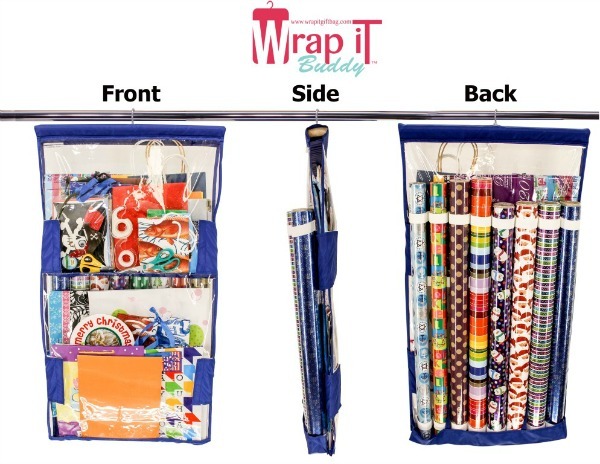 The Wrappy helps you neatly organize your rolls of wrap and your gift bags and tissue paper, all in one neat organizer that you can hang on the back of a door or in a closet... and you know how much I love maximizing vertical space! 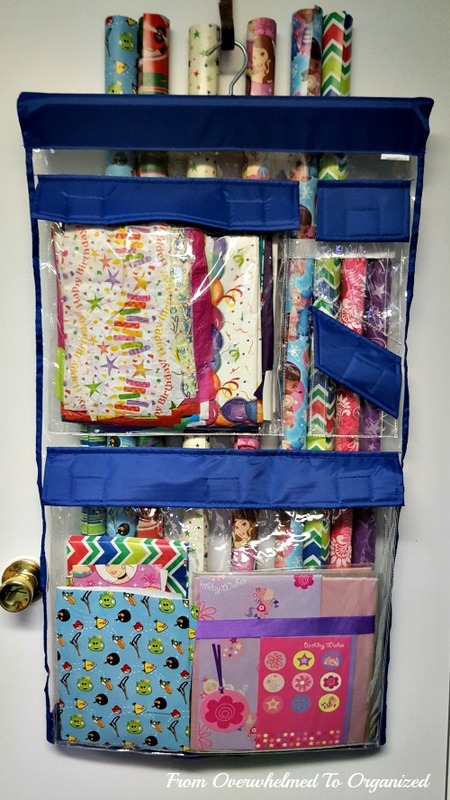 You get pockets for flat wrap, gift boxes, gift bags, tissue paper, scissors, and tape. And on the other side you get elastic rings to hold your rolls neatly in place. And you can hang it anywhere! Or even slide it under your bed. Here's Adam, the creator of the Wrappy, to talk about how it works. The Wrappy is great for either holiday wrap or everyday wrap... or even both if you don't have very much of either one. Here I've used it with some of my Christmas wrap. I started by putting some Christmas gift boxes and various sizes of gift bags into the pockets on the front. And then I put my rolls of holiday wrap on the back. I don't have as many rolls as the Wrappy holds, but I put the 4 short and 3 long rolls that I do have into the elastic rings. This version of the Wrappy meant for 30" rolls (there's a deluxe version that fits the longer rolls). But I was able to tuck a few long rolls in to this one. They just stick out a bit on top. The Wrappy sure keeps the rolls neat! Just twist the roll a bit to hide the cut edge and then it won't rip or tear. And the rolls don't unravel so everything stays in great condition to use when needed for all your wrapping! I've decided to use my Wrappy with our everyday wrap... to solve the problem of my ripped up rolls of wrap and also my gift wrap bins that keep getting messy. I decided to use the pockets for all our tissue paper and flat wrap. I was able to fit everything from one of my bins into the two big pockets! I'm using the top pocket of the Wrappy for our tissue paper (used and new) and the bottom pocket for our flat wrap (scraps and full sheets or packages). This is a much better system for us than the bin. It will be easy to just pop re-usable tissue paper or larger scraps of wrapping paper into these pockets and easy to find exactly what we need when it comes time to wrap a gift! And on the other side of the Wrappy, I have all our open rolls of birthday or everyday gift wrap. Again, I have a few long rolls sticking out the top, but it works for me... and it's so much better than all the paper getting ripped and worn in that tall bin! I'm still keeping my unopened rolls of wrap in my tall bin so they are out of the way. I stocked up on a bunch when they were 90% off at Target before they closed here in Canada so I'm set for several years I think! You can get your own Wrappy here. 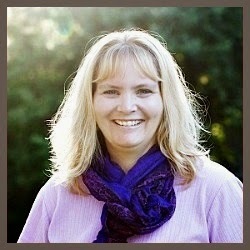 Or check out the rest of the Wrap iT website to see pictures and videos of all the other members of the Wrap iT family! There are several versions that are bigger if you have more gift wrap and bags than what fits in the Original Wrappy. There's also a brand new shorter version that accommodates 27" rolls of wrap that you get at dollar stores or Costco. It's called the Buddy Wrap iT. 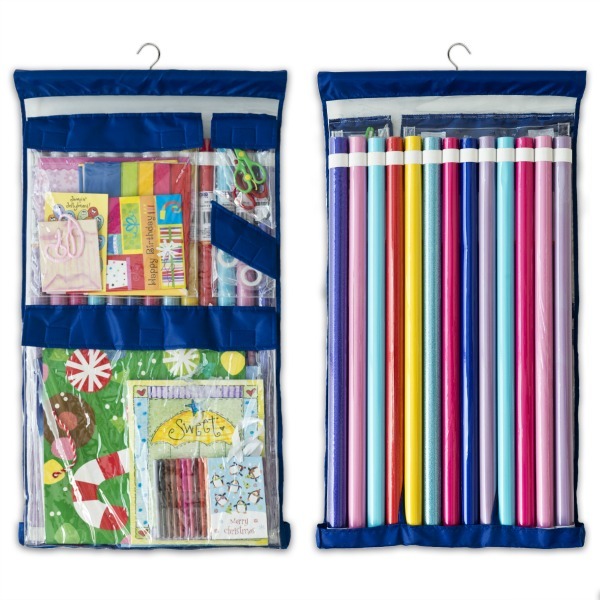 The Buddy has 2 large pockets that open at the side, making it really easy to get things in and out. And as I mentioned it's designed for short 27" rolls from discount / bulk stores. 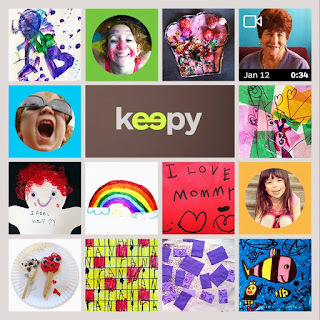 You can also find Wrap iT here: Facebook, YouTube, Twitter, Pinterest, and Google+. Now on to the giveaway! One of you lucky readers will win either an Original Wrappy just like this one or a Buddy Wrap iT (your choice). Just enter using the Rafflecoptor form below. Open to US and Canadian residents only. 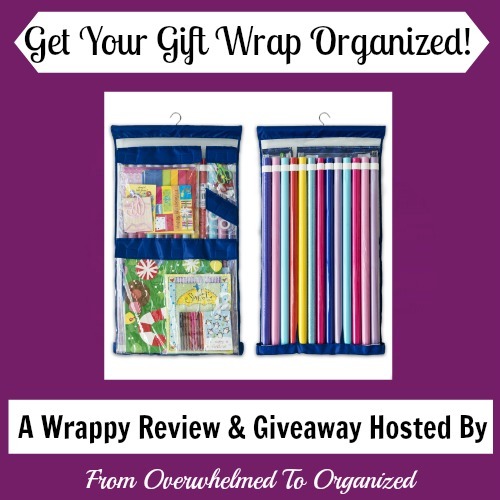 If you win, Adam and I would love to see how the Wrappy or Buddy Wrap iT helped you organize your gift wrap! Please share your before and after pictures in the comments or by email. Good luck in the giveaway! And have fun organizing your gift wrap! How do you organize your gift wrapping supplies? How much gift wrap and how many gift bags do you have? My wrapping stuff is all over the place, stashed here and there in my basement. This would be so useful! That was our problem too Jenny!! It definitely helps when it's all together Jenny! Good luck! I think this would consolidate our wrapping even further. All of mine is in a long bin under the bed...annoying to pull out. But I don't even use half the space it takes up. I've tried bins under the bed too and I also found it annoying. I much prefer using vertical space and being able to hang this anywhere is great! OMG that's awesome! This would keep my wrapping paper from getting destroyed in the storage container we currently use. I love that part of it the most Danielle! you are awesome Danielle - good luck! What a fabulous idea! My wrapping paper is EVERYWHERE and I was just looking for a solution. This would be perfect! Thank you for the wonderful giveaway. The Wrappy would be a great solution for you Erin! Good luck! Thank you Erin - so happy you like it! Cheers!! Usually my paper gets ruined because it's not stored right. I love this! 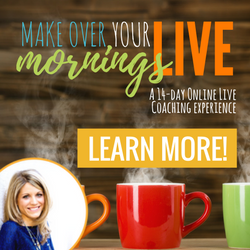 Having something like this really helps Cari! Good luck! and we love you Cari, thanks for the compliment! I have something similar but it doesn't hold nearly as much stuff as this could. Pick me! Sorry... it's random Melissa :) But good luck! Oh I am so sad that I live in the UK. No chance of getting one. Sorry Sandra, for the giveaway it's only for US and Canada. These are available on Amazon though... so you can check there. And I'll check with Adam whether he ships to the UK if you buy one through the Wrap-iT website. I checked and you can get one shipped to the UK Sandra if you order through the Wrap-iT website! You'll love the Wrappy then Tammy! Good luck! 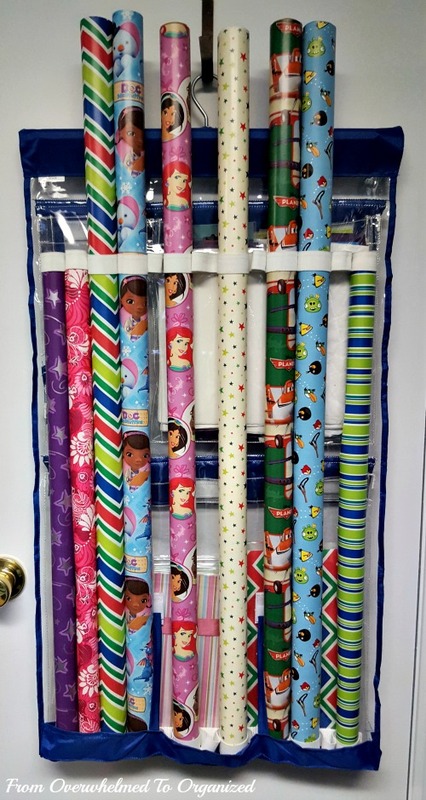 Great way to organize wrapping paper. I do have mine just sitting in a closet. Thanks for the chance. Merry Christmas. This will make it so much easier to see what you have Linda! Good luck! And Merry Christmas to you too. I love that you can fill it up and tuck it in a closet out of the way. I keep only the bare necessities for gift wrapping and I don't need them to be out and within arms reach all year long. Yes Alli it's great to be able to tuck those holiday wrapping supplies the other 11 months of the year! And this stores them in a way that doesn't squish or tear anything. I need one of these for my 'on hand' paper. I have a lot of wrapping stuff but it is squirreled away in the garage. This would be great for the 'regularly used' stuff. This is so handy for that Kim! Makes it easy to get what you need quickly. I need this! Every time I open our hall closet wrapping paper tubes fall out on me! LOL Ally! I remember that feeling when I had all my napkins, paper plates, plastic cutlery, etc. on the top shelf of a cabinet... I never knew when an avalanche might hit my head! 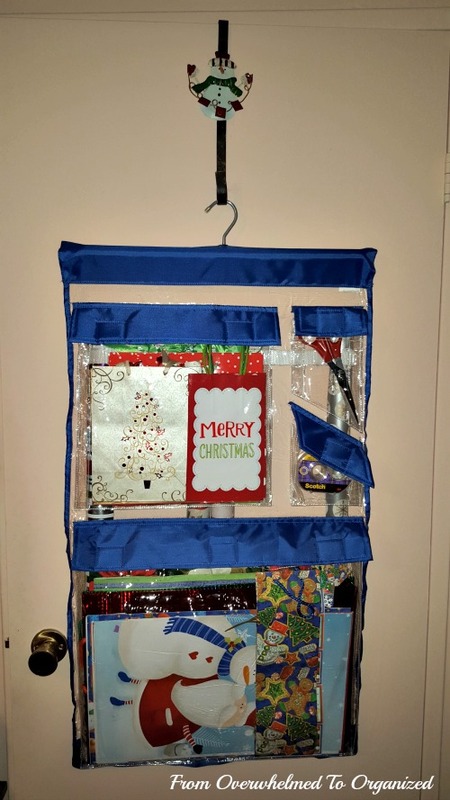 This is a wonderful system for organizing gift wrap. I've been storing mine on the closet floor;it never fails that one of the cats gets in and shreds the paper. I definitely need this! Oh this would definitely help Jane! Getting your gift wrap off the floor will keep it safe from your cats. Happy holidays to you too!